Tired of seeing 1 block wide stacks of blocks in your world? This mod will prevent that. No more stone, dirt, wood, w/e collumns. Your players will have to put some thought into their constructs, like perhaps a stairs, or a pole with a ladder. This doesn't stop all kinds of ugly, just that one type of ugly with the single stack of blocks reaching high above the ground. This version now supports a whitelist so that you can specify blocks to allow nerdpoling on. By default it adds Minecraft Sand (and red), gravel, NotEnoughScaffold scaffolds. These are all blocks that when the bottom block is removed the remaining blocks fall down in some way. Scaffold blocks come completely down, the minecraft blocks you know how they come down so have that torch ready. No need to ask, just add. No need to ask, just comment below with your video url. I hate those derp poles everywhere - great mod! There is already a block physic mod. Look at Repose. soil is affected by gravity and will spread sideways into piles when landing. This makes creating slopes easier, but it also makes early-game shelters more challenging. Fine-grained soils such as sand and gravel can also spread as a response to nearby block changes, and so hitting a sand wall can cause a significant collapse. Config options allow control over this falling/spreading behavior. First of all it's very good idea but in the way it's now a player could abuse it to grind flint... and other staff in some mods. Can you make it just to prevent the player to place blocks instead of breaking them ? thanks good call. I don't understand why it is giving flint tho. I'm not actually breaking the block. I'll check to see what I can do about it. What I was doing was using getitemfromblock which calls getitem in the block code if it exists and for gravel that gives a random flint. So I had to rewrite it in the more complicated style, but now the mod is much better for wear as a result. thanks. You won't believe the number of people in regular chat that are like "why would you?" or "I haven't noticed!". I suspect they run very private servers with little to no players on them. what happens if I try to make a block collumn with this mod? is this mod realistic? you add this mod to your server and client when you notice players making dirt and cobble poles to get to the sky. if you place a few blocks and then a ladder on the side, you can make a pillar that way. Why would you ask if the mod is realistic? there are no realistic mods in minecraft, heck minecraft isn't even realistic. Clearly it's not realistic. this mod has one purpose to prevent those stupid 1x1 piles of blocks that reach to the sky that players use to push theirselves higher and then never dismantle. 1x1 piles can still be constructed but you have to think about it first. Maybe it is more real in that way. Again realism is a point of view. 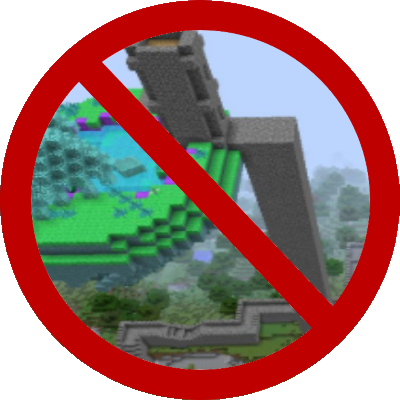 I personally wouldn't add this if you and yours know not to leave 1x1 piles of blocks lying around that served no purpose other than to reach a high ledge or a sky island.